When Ian Usher put his "life" up for sale on eBay in 2008, he had no idea where life"s adventure was going to take him next. Asked many times in interviews, "What will you do once you have sold your life? ", his usual glib response was, "Anything I like, really!" But what did he really want to do next? After some frantic list writing, and last-minute planning, a two-year adventure developed - a list of 100 lifetime goals, and a challenging timeline of 100 weeks! This book details a few of the most practical and useful tips learned during that time. 17 Travel Tips to help you save money, and make your next adventure less stressful and more enjoyable. 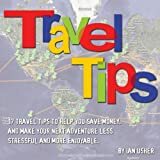 Do you have any travel tips of your own for future editions?